Coalition for the Homeless and the Center for New York City Affairs at The New School co-sponsored a policy forum today analyzing record family homelessness and detailing housing-based solutions that Mayor-elect de Blasio can enact. Despite record homelessness levels, New York City has a strong legacy of successful approaches to family homelessness that the new Mayoral administration can build upon. A panel of experts today offered concrete ideas on what a de Blasio Administration can and should do. Panelists included Ellen Baxter, executive director, Broadway Housing Communities; Elizabeth Brown, budget and policy analyst, NYC Independent Budget Office; Joshua Goldfein, senior staff attorney, The Legal Aid Society; Patrick Markee, senior policy analyst, Coalition for the Homeless; Brendan O’Flaherty, professor of economics, Columbia University; and Louis Rodriguez, executive director, St. John’s Place Family Center & member, Homeless Services United. 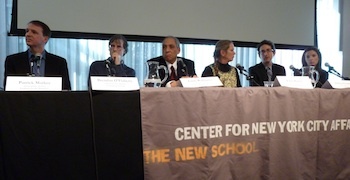 The panel discussion was moderated by Andrew White, director, Center for New York City Affairs at The New School. Coalition for the Homeless also offered a presentation describing the scale of the family homelessness crisis, the major causes, and recommended policy reforms for the new Mayor. The presentation can be downloaded here (PDF).